Whether your child should swim with a fever depends on several factors, including your child's age, other symptoms and how high the fever is. Also consider the nature of the swimming activity: Recreational swimming is probably fine for a child recovering from an illness, but wait a bit longer before you allow her to swim laps at swim team practice. Consider the child's activity level when determining how ill he is. A child who is listless, sleepy or has no appetite needs to rest at home, but a child who continues to play normally can probably go swimming. Body temperature fluctuates as much as two degrees throughout the day, peaking in the afternoon to evening, according to KidsHealth.org, so it's possible that a child running a low-grade fever below 101 degrees F is not sick at all, but just warm. Monitor your child for other symptoms of contagious illness before sending her to the pool. A child with a runny nose, cough, vomiting or diarrhea should stay home because her body is fighting a viral or bacterial infection and she needs to rest. Also, taking her to the pool could expose other swimmers to the illness. However, many children run low-grade fevers when they are teething, but they are not actually ill, according to MedLine Plus. If your child seems comfortable, eats and sleeps normally and shows no other signs of illness, pack your swim bag and go. A child who has a fever over 101 degrees is probably fighting off an illness and definitely needs to stay home, even if you use fever-reducing medications such as acetaminophen. 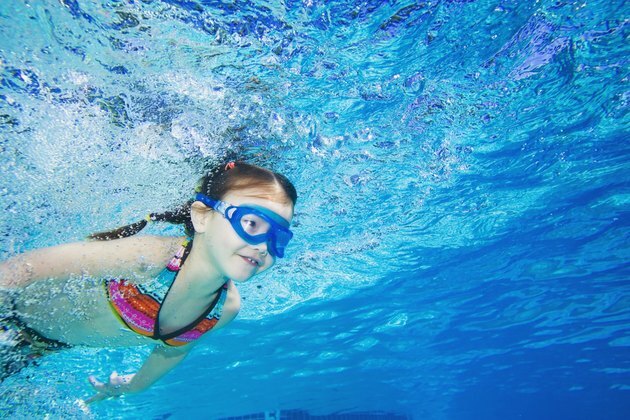 The energy expended through swimming, as well as exposure to cold water, might further weaken your child's immune system, potentially prolonging the illness or making it worse. Keep your child home until she has been free of fever and other symptoms for 24 hours and has resumed normal activity. Your child might perk up after receiving acetaminophen, but she should continue to rest for at least 24 hours. A fever is not an illness but a symptom of an illness, and the body's response to invading germs. Although fevers worry parents and cause discomfort to children, they are a sign that the body is working to heal itself. Don't rush to treat fevers immediately, especially if the child is relatively comfortable. Lowering a fever prematurely through medication can halt the body's healing process. Encourage your child to rest quietly rather than engaging in active play or sports, such as swimming. Offer clear liquids, diluted herb teas or mild soup to prevent dehydration and give your child a bath in slightly warm water.